Get Married & Start Your Family! 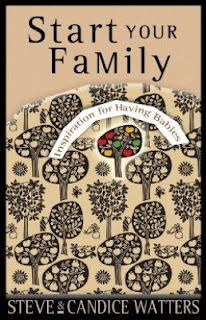 When I saw the titles Get Married : What Women Can Do to Help It Happen and Start Your Family : Inspiration for Having Babies (both offered by Moody Publishers) I simply HAD to read them to know what their arguments were. I love a book that promotes thought and conversation and two such titles seemed almost too good to be true! Did I expect to agree with them? In part, yes, I did. I also anticipated the desire to pick them ruthlessly apart. They were pretty much exactly as I expected them both to be and I found them utterly fascinating. In Get Married we meet author Candice Watters who was the epitome of the D.C. worker-on-Capital-Hill out to make a name for herself and change the world. She was pursuing an advanced degree so that she could make herself more effective in Washington when her professor said something that rocked her world. He said that the only way to truly make a difference in the world was to get married and have children. At first, she found his advice almost repulsive. It was a new argument but the more she thought about it, the more she realized how accurate that statement was. The only way to truly effect change is to produce people who can effect change for generations to come. However, she wasn't married and this was somewhat problematic for her. It wasn't as if she didn't want to be married. It just "hadn't happened." Placing herself under a mentoring couple who also acted as matchmakers, she met Steve Watters and developed a friendship with him that eventually led to the alter. The arguments in this book are pro marriage (if you couldn't figure that out) in a big way. She is arguing against the modern culture that would suggest that you, as a woman, should go forth, take on careers and "do it all" before you settle down with a man. Instead, she says that we should dismiss the world's arguments that marriage isn't for everyone and instead say something like this: marriage is for most people, it is not for a few. (Her arguments are reminiscent of the ones made in Getting Serious About Getting Married which I reviewed here, garnering a measly 66 inflamed comments. In fact, she quotes Maken in this book.) I agree with that statement on its face. Marriage is for most. It is not for a few. The problem with today's society is that it has devalued the gift, blessing and design of marriage. Instead of marriage being presented as a beautiful union which promotes freedom like you cannot image, it's likened to a ball and chain. People are encouraged to avoid it if at all possible. I think that's very sad and flies in the face of the created order God designed - marriage between one man and one woman, for life (with exceptions given for sinful matters, don't bite my head off) - and meant to bless us. In short, the first step towards getting married is to say that you want to and live like you mean it. For all intents and purposes, I did rather agree with this book. I just had a bit of a hard time with the delivery of the message. 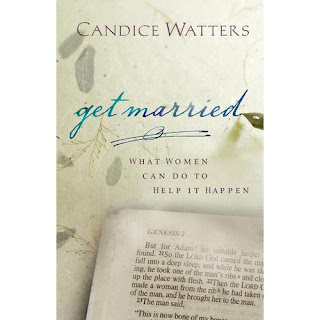 It was hard to hear the message around the "opinion" of Candice Watters. She felt so "right" that you just wanted to find something wrong with her, if you know what I mean. Some of the arguments came across as being harsh and I didn't think that served her purpose in writing the book very well. That said, she also acknowledges that she's a strong-willed individual. That definitely plays out in the book. Start Your Family probably holds more arguments that I do not agree with than the first book did. It is written by Candice and her husband Steve which I did rather appreciate for two reasons: 1.) You get the man's perspective in this argument and 2.) Candice is a little more toned down which makes it easier to understand what is being said. The thing I appreciated the most is how hard they worked to stress the fact that children are not a burden (though they are hard work!) so much as they are a blessing. Today's society completely devalues human life (in most forms and functions!) and having a book that stands up and declares that it is good to have children is very welcomed. Case in point (and this is kinda hard to believe, I know): when Jonathan and I were married we received a wedding card in which the person wrote that they thought the mandate to "be fruitful and multiply" was taken to extremes and interpreted incorrectly. They argued (in our wedding card!) that we should not be too hasty to have children, and certainly advised against having too many. (You may now collect your jaw from the floor.) Being that this person had no influence over our lives, we didn't take the advice to heart. Our position is that children are a treasure from the Lord and an extreme blessing. We had no expressed plans for children in any time frame or quantity, but we were perfectly happy to have them! And we still are! Now, our wedding card was written from one Christian to another which is rather pathetic given scriptures blatant statements of the blessing that comes from having children. They also hit on fears such as, "I don't want to bring children into this crazy world" and they deal with the money issue. Can you afford to have many children? On this part I don't really agree with them. They argue that children are worth the expense (and I agree!) but they argue that you can have as many children as you like and be in debt over them. On this I have a hard time agreeing. I know we live in an unstable economy and nothing is ever guaranteed. However, (and I am perfectly willing to say that this is just my own personal and very faulty opinion!) that there is a good argument to be made in factoring in the cost of having children. Let's say there was a family in poverty, living in a shack and the wife discovered she was pregnant with the 9th child. Part of me would be frustrated. Most of me would say - hey, they ARE married. They are purposing to raise their family up as best as possible. I can support that. Then I think of people like Nadya Suleman and I think to myself that there is something terribly wrong with an unmarried woman producing so many children that she can't take care of and expects the state to step in and support. Not a lot of thought. That bothers me. (That said, the children, once conceived, are live human beings (life!) and I would never under any circumstances suggest should be aborted.) I would just say that there is something to be said for having a stable home environment which presents adequate resources for raising healthy children. So I WOULD be cautious where money is concerned. I would personally think twice before planning to have a child when I couldn't afford to do, reasonably. I would not argue that it is wise to throw that argument out the window when deciding to procreate. So. This book is interesting, yes? I could go on a bit more about it because I thought it provided a lot to think about and ponder. However, this could start to become too long. Marriage is a blessing. So are children. Both ideas deserve some serious consideration and attention and if there are books that will cause us to grapple with both then I say, "Bring 'um on!" These are two such books. Obviously, the first book interests me more than the second because of my place in life. To some point, arguments for marriage and early marriage (something that I support, for the most part) frustrate me because I feel helpless to bring that about in my life. In part, because I am. I have to balance the take-the-opportunities approach with a be-content-in-God-where-you-are attitude. Yup, I think there is that. For disclaimer purposes, I was married at 26. I wouldn't have thought that was so "old" but most of my friends married at an average age of 20. It wasn't that I didn't want to get married. But it was also not so very comfortable to feel like I should go about shouting my desire from the rooftops. There IS something to "being content in all situations." I think she makes a good point that singles should SAY that that is there intent. Even if it's just at the beginning of dating relationships - so that the other party knows that the time together spent is not just in jest. It is purposeful. Yes, I do agree. There's a balance somewhere and as I said, this book makes it hard to see that at times but good point! Good point! Thanks for the reviews. I'm enjoying reading your commenters thoughts. Just to clarify a key point: the octuplets story is not a good example of someone being fruitful and multiplying--it lacks the context of marriage. Essential to the SYF message! Our goal in the money chapter was to communicate that the noble desires to pay off school and consumer debt that many couples have is in tension with the window of opportunity they have to bring life into the world. The decision should go beyond just doing a cost/benefit analysis. Thanks for your remarks. And I think that is what I was saying (although it was tough to work it out in words). The example of the family living in the shack was said that it would frusterate me. However, I would also have to say that they are married. Nadya is not. And nor is she remotely responsible when it comes to finances (it would appear). Part of my position is how I feel about debt. Just as you've argued in your books that we need to "get back to basics" and see what God says about getting married and having famlies, I also think that we need to take a look at finances and how they are managed. I understand what modern society says about school debt and mortages and that's a whole 'nother argument. What I'm hinting at in this post is that I don't necessarily think we are thinking biblically in THAT department either. Clarify how we are supposed to approach money, and my arguments about debt and children fade away almost completely. Still, I think there is a biblical argument that exists that you should think through whether or not you can afford to have and care for children. Not that anyone needs to be "wealthy" - I'm not going THAT far! I'm thinking more along the lines of whether or not someone could provide adequate food and clothing so that their children are not naked and hungry. It would be an extreme case of destitution that I would probably have concerns about. But all that said, I still think we need to think about DEBT differently. Then, as I mentioned, my objections would be non-existant. Dawn - Yes, you are right about these books approaching thing from a biblical perspective but all the same I appreciate your comment and think that is very cool that you met your husband when you were 18! What a fun history. Thank you very much for sharing. I also do feel compelled to point out that my feelings on debt will differ on whether its accidental (any number of ways that can happen) or on purpose. I'm not referring to "accidental" debt. I'm referring to needing to have a biblical mindset towards purposeful debt. Being a fan of the Watter's from their work at Focus (esp the Boundless articles/show), I'm so glad you reviewed these! I've not read either (yet) but read (and heard) a lot of what they think. In our society that devalues and destroys traditional marriage, gender roles, and family in general, I am stoked to see a stand being taken for marriage and family. I know it has challenged the way I perceive all of the above and I would even say I'm much more excited for marriage and family as a result of Candace's strong personality. If that's what it takes to communicate this important message, I'll pass on the "spoonful of sugar." VERY good point, Janice! It is taken. And I've watched one too many pining-for-marriage woman settle down with a bad apple. Being alone is sometimes the best path. I have several single friends who would throw this book out the window just because of its title. They are more than ready for marriage and are tired of the complete losers that their friends keep setting them up with. At the same time, other reading has led me to be more open should my own children come home and want to marry at 20. If you meet the "right" person at 20, more power to you. Very few of my friends did. And for Carrie's point about finances...I will forever remember the father of 11 who told me that others should be responsible for financing the education of his children because he had done his duty to have them. Brother. I reject the belief that having a large family creates poverty, but it seems Scripture is pretty hard on those who don't provide for their own. Such an interesting, thought-provoking review! I haven't read either book, though I did hear them briefly on Family Life Today. I actually went and read your other review you referenced also. I think this is such an interesting topic. I was a teenager when, "I Kissed Dating Goodbye" was popular and did the whole courtship thing. :) I still hold to those views in a lot of ways (namely, waiting until you are actually old enough to marry to date/court), but have been challenged on some other views by authors like this. These books sound really interesting and thought provoking. Not sure I'd agree with what they are saying all the time, but still, it's great to pick up a book that makes you think about these issues and form an opinion and discuss it with your family and friends. Great reviews! Of the couple in a SS class with me who told us in class that the husband was going in for vasectomy tomorrow, and would we please pray that he could go back to work on Tuesday? There was obviously no prayerful consideration of the pros and cons (you'll have to trust me on that), and it was a decision made in haste and thoughtlessness. Of the Christian woman who told me, loudly, in the foyer of the church about how she and her husband had always planned and wanted to have only one child and how their son (second child) was a "mistake"---while the aforementioned nine year old son was playing with friends nearby! And there are more. All I want to say is that if you're making decisions about how and when to get married or to have children or how many to have and you are a Christian disciple, maybe, just maybe, it would be a good idea to spend a few minutes (days) in prayer before making those decisions. Finally picked up this first book a couple of weeks ago. I remembered you read and reviewed it some time ago, but I didn't want to re-read your review until I had a chance to read it myself. I basically agree with your review, just obviously am coming at it still from the "other" side...I'll be publishing my review either today or tomorrow.